Behind the unmistakable appearance of each Crested is a loyal and loving pet who’s content to sit in your lap all day. Here are 10 things that will help you get to know this smart, friendly breed. 1. Chinese Cresteds dominate the World’s Ugliest Dog Contest. What does a Chinese Crested look like? Hairless and Powderpuff Cresteds: what’s the difference? 2. The Chinese Crested is often called a ‘velcro’ dog. 3. Most Chinese Cresteds are seen, not heard. 4. These dogs are clever escape artists. 5. Cresteds love learning new tricks. 6. 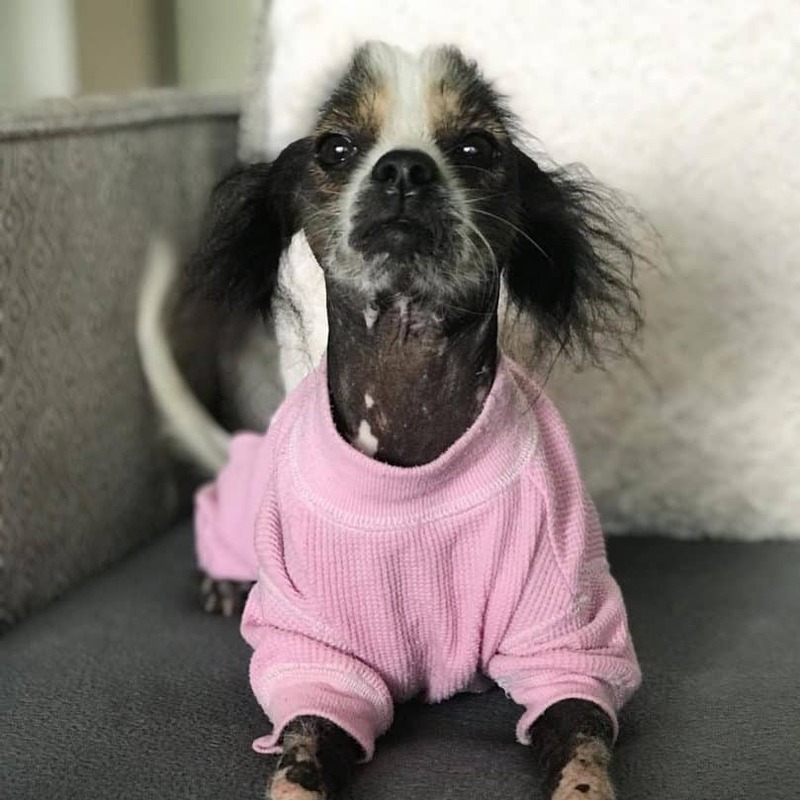 The Chinese Crested needs plenty of TLC. 7. The Chinese Crested is less likely to make you sneeze. 8. Depending on the variety you have, your Chinese Crested may have bad teeth. 9. 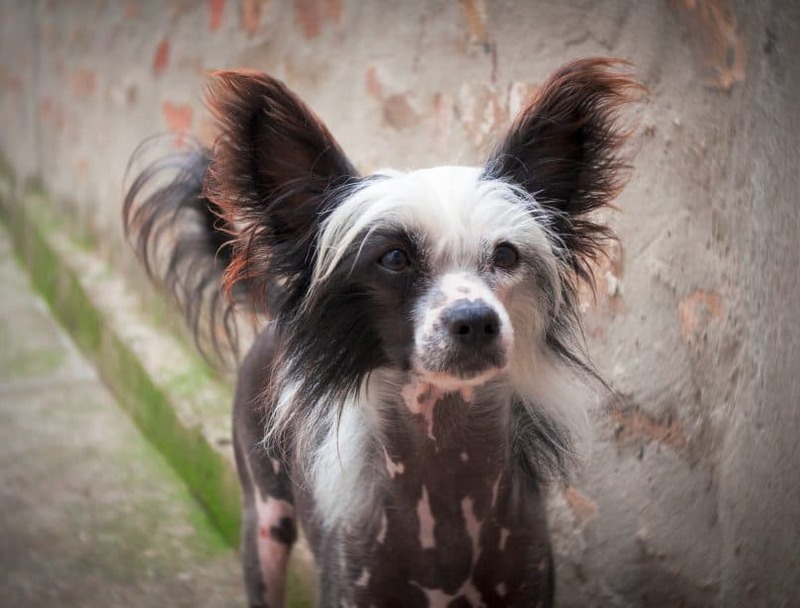 The Chinese Crested has traveled all over the world. 10. The Chinese thought the Crested had magical healing powers. Where can I buy Chinese Crested puppies? Chinese Cresteds have won the World’s Ugliest Dog Contest a whopping 9 times since 2002. Sam, a blind, toothless hairless Crested, held the top title for three years, from 2003 to 2005. Its unique appearance is something that people celebrate about the breed. Another winner, named Rascal, has become popular enough to appear in films and talk shows. The Crested’s appearance definitely sets it apart from its peers. These dogs have wedge-shaped heads, long muzzles, and erect ears, along with a body covered in spotted pink skin. The breed gets its name from the long, flowing hair on its head (called a crest). The longer paws on the Chinese Crested are often described as ‘hare-like’, compared to the oval feet most dogs have. Not all Chinese Cresteds look like what you would expect. There are currently two recognized varieties of the breed: the Hairless and the Powderpuff. The Hairless variety is what we often see in media. These dogs have tufts of hair on their heads, ankles, and tails and smooth, soft skin on the rest of their bodies. Often described as human-like, the skin comes in colors ranging from flesh to black and may have spots or white markings. True hairless Cresteds have very little to no hair on their body, but others are capable of growing an almost-full coat of hair if left ungroomed. The latter are often called ‘hairy hairless’ Chinese Cresteds. The Powderpuff Chinese Crested (Puff), on the other hand, has silky, flowing hair all over its body. Unlike in most canine breeds, this double coat is unique because the undercoat is much shorter than the overcoat. Whether Hairless or Powderpuff, Cresteds come in a wide variety of colors, from light hues like apricot, palomino, and cream to darker shades like chocolate, black, and blue. If you’re looking for a canine cuddle buddy, look no further than this breed. Puffs have a reputation of being a little more independent compared to their Hairless brothers, but, all the same, they’ll love sticking to your side all day. These affectionate dogs won’t hesitate to curl up next to you in bed and will gladly soak up any attention you give them. Chinese Cresteds use their toes to full advantage when it comes to being clingy. Don’t be surprised to find your dog using her paws to grip your neck when you pick her up. Cresteds are intensely social, but they bond the most quickly with their families. They’re prone to separation anxiety, too, so you don’t want to leave them alone for extended periods. These dogs love to make their owners happy with their playful, entertaining ways. Many of them are often described as ‘cat-like’ because they enjoy perching on high places, like the back of the couch. Friendly with kids and even other pets, the Chinese Crested isn’t usually aggressive. However, playtime with toddlers and preschooler-age children should be supervised because they could accidentally hurt the Crested’s fragile frame. The Chinese Crested is not a yappy dog. These canines tend to be quiet around the house, but they won’t hesitate to bark to alert you of potential intruders. They also have a distinctive howl that you may hear when they’re excited or happy. If you’re sensitive to high-pitched sounds, you can train this behavior out of your Crested. With their natural guarding instincts, Chinese Cresteds make for good guard dogs, despite their small size. The Chinese Crested doesn’t let its small body limit its activities. Heights don’t faze this dog at all, whether it’s climbing a fence or jumping off a table. Some Cresteds are even accomplished diggers, going under fences to explore their environment. 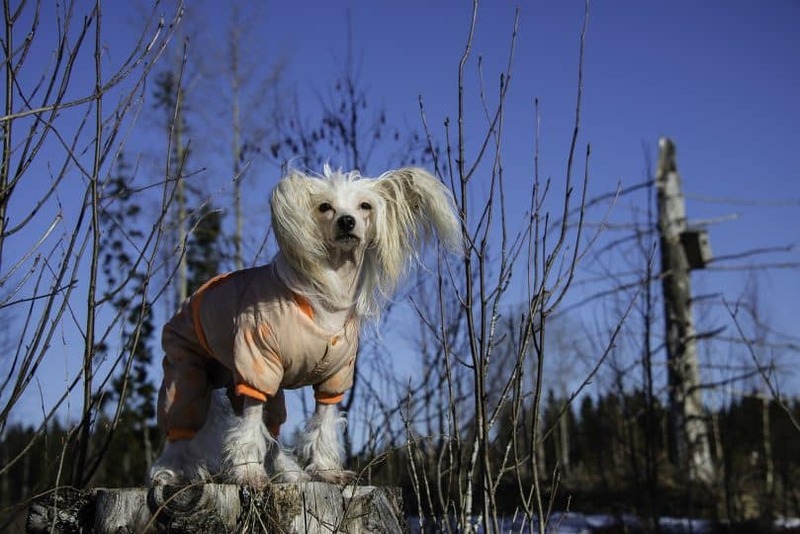 Despite its prowess as an escape artist, the Chinese Crested is not a high-energy dog. Thirty minutes of moderate exercise a day is enough to keep the breed happy. This medium energy level makes the dog a great pet for mobility-challenged people and the elderly. Quick daily walks and play-sessions are good ways to give your Crested the exercise and bonding time he needs. Make sure to keep him leashed when outside; his high prey drive will make him chase small animals that get too near. This dog will be satisfied spending its energy indoors, so it’s perfectly comfortable in apartments and other small living spaces. And don’t be surprised if your Chinese Crested barely pants at all after being active all day. Unlike other breeds, these dogs cool down by sweating it out. Though they’re indoor dogs, Cresteds will love playing and running outside. Unfortunately, they have sensitive skin that can easily become sunburned. Make sure your pet doesn’t come home in pain by applying a coat of sunscreen on its skin. You can also use shirts and other protective clothing to keep your Crested’s skin safe from the sun’s harmful rays. The Chinese Crested’s intelligence and natural curiosity make it easy to train. Plus, your dog will love spending time with you, so it will enjoy one-on-one training sessions. Despite its eagerness to please, this breed is known for its sensitivity. 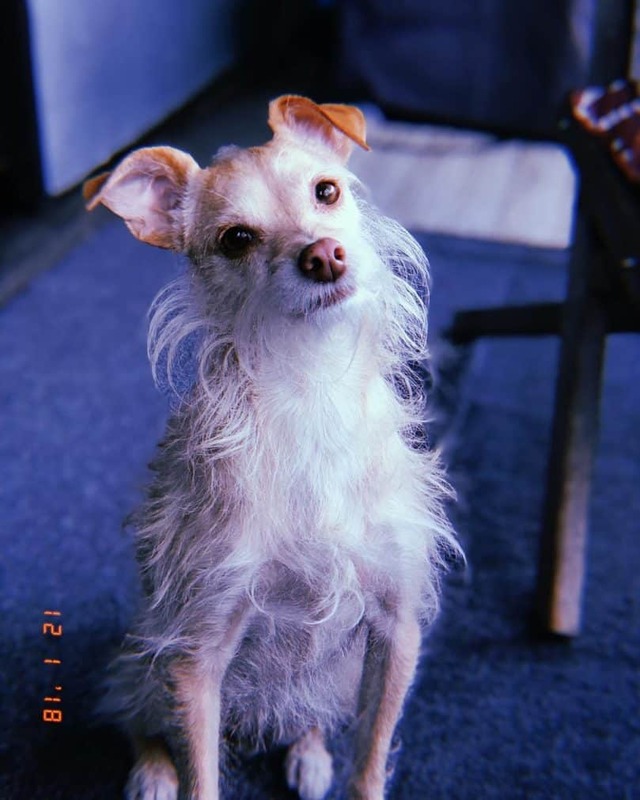 Remember to be patient and consistent when you’re teaching your Crested tricks or commands, as your dog will detect changes in your tone or attitude. Positive reinforcement always works with this dog, who loves to eat and will do anything for a treat. Just don’t over-indulge your pet; like all small breeds, the Crested is prone to obesity. 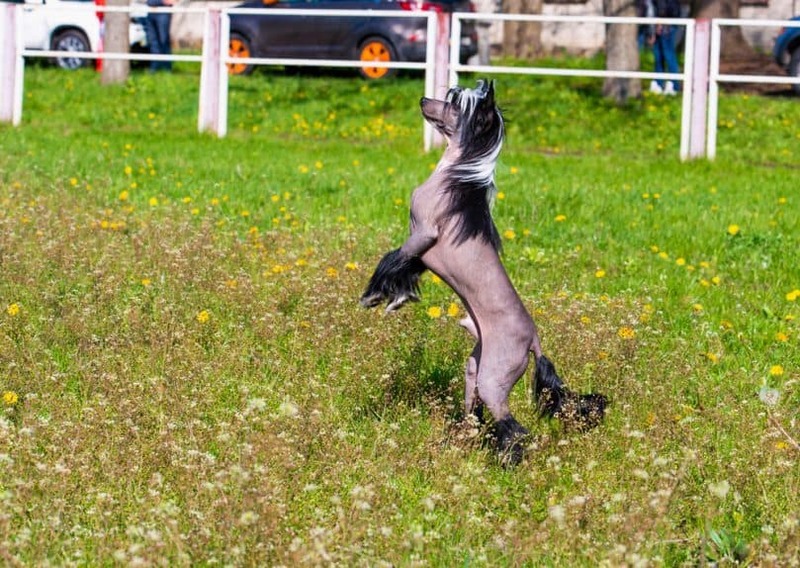 Some say that the Chinese Crested is hard to housebreak, but firm training and plenty of praise will go a long way in correcting your pet’s bad behavior. Combined with its naturally affectionate nature, the breed’s trainability makes it an excellent therapy dog, especially for seniors. This dog is a regular participant not just at Ugly Dog contests but also at dog shows all over the world. Cresteds can hold their own against other dogs in obedience and in competitive sports like agility and flyball. Chinese Cresteds will also happily flex their prey drive and do some lure coursing with their owners. All dogs need love, but caring for the Chinese Crested takes a bit more time and effort. The Crested needs to be fed only ¼ to 1 cup of high-quality dog food a day. Dividing this amount into two meals ensures that your dog develops healthy eating habits. This breed easily gains weight, though, so make sure to stick to its recommended daily intake and go easy on the treats. 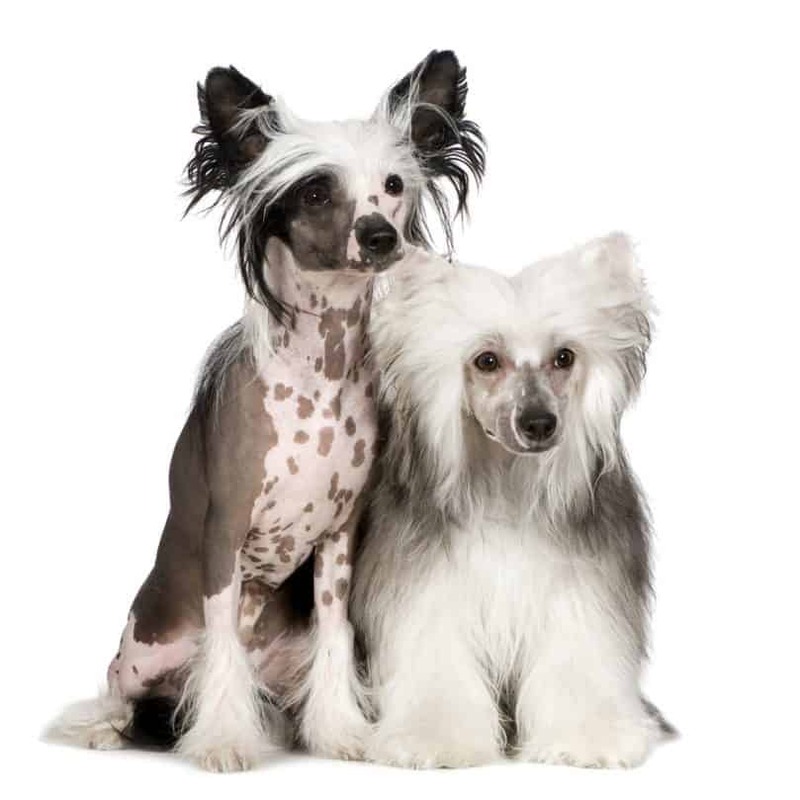 Both Hairless and Powderpuff varieties need a bath every week or two, but the Chinese Crested is generally a clean, odor-free dog. Baths will also help keep the Powderpuff’s long hair in excellent condition. If you own a Puff, grooming is what you’ll spend most of your time doing. Brush your Powderpuff’s coat daily to maintain its fluffiness and prevent mats and tangles. The good news is that the Puff’s coat is easy to brush because the overcoat is longer than the undercoat. Puffs’ coats can grow to be quite long, so you might want to trim your dog’s hair occasionally for easier care. Give your Chinese Crested Powderpuff a pony cut by trimming its body and leaving hair long on the head, tail, and the lower parts of the legs. You won’t have to do much grooming on the hairless variety, but its exposed skin will need plenty of care. After bathing your hairless Crested, use a mild cleanser on its skin and follow up with a coat of hypoallergenic lotion to moisturize. Be careful in choosing a lotion for your Chinese Crested, as many have lanolin allergies. Avoid squeezing pimples or blackheads on your dog’s skin so you can prevent infections, scarring, and discoloration. 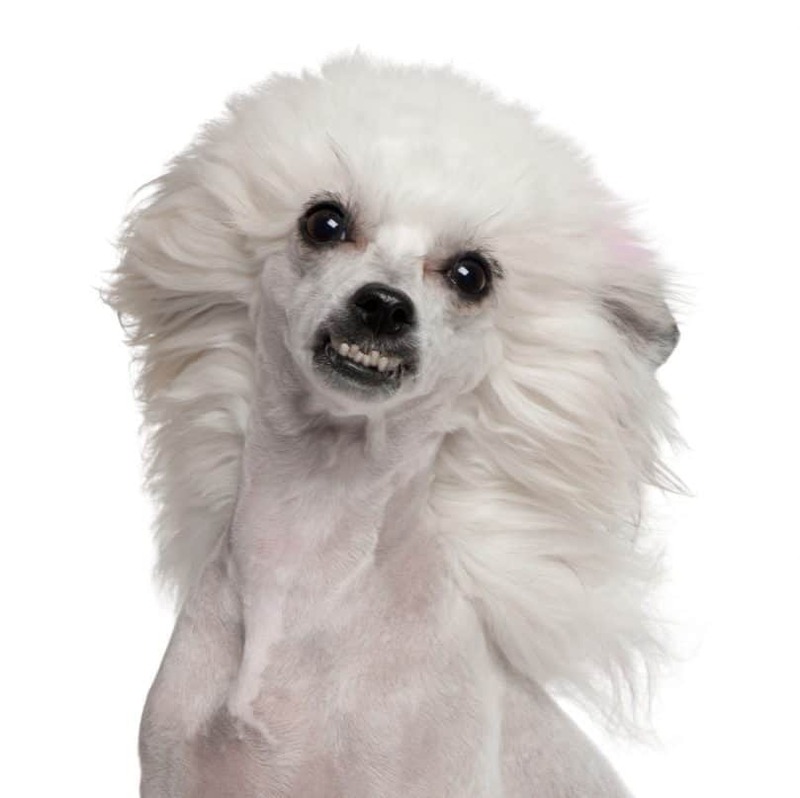 You can keep acne at bay by regularly washing your Chinese Crested’s clothes with a gentle detergent. As I mentioned before, sunscreen provides essential protection for your hairless Crested’s sensitive skin. If your little pal does become sunburned, an oatmeal bath or some aloe vera will do wonders in soothing the pain. Another thing you might want to do with your Crested, especially if you’re planning to enter it into a dog show, is taping its ears. The AKC breed standard requires hairless Chinese Cresteds to have standing ears, and taping is the best ways to keep those ears erect. The procedure is relatively painless for your dog if done properly and early enough. 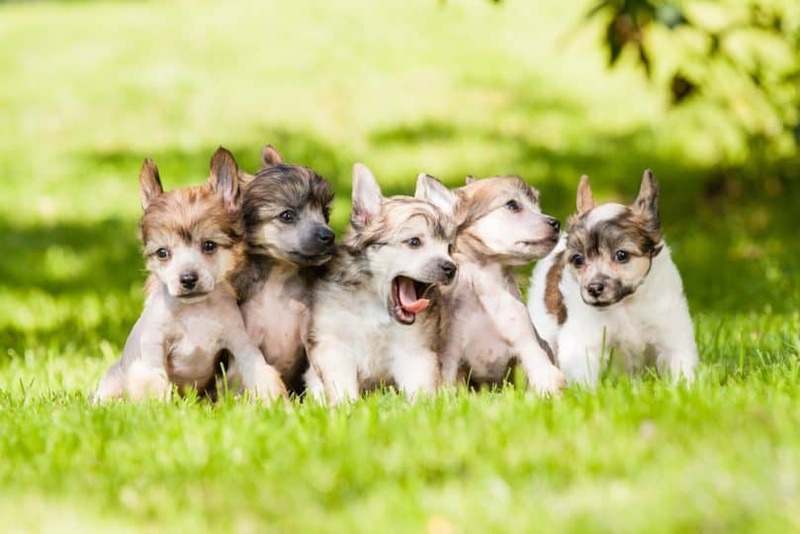 Many breeders will have started the process even before Chinese Crested puppies go to their owners. Here’s a quick step-by-step guide to taping your Chinese Crested’s ears. Shave your dog’s ears to make it easier to remove the tape when needed. Make sure to trim the hair on the inside and outside of each ear. The ears should be left completely bald. Use a gentle cleanser to remove wax and dirt from the ears. This ensures that bacteria won’t breed in the ears once they’re bound. Cut two strips of hypoallergenic, breathable tape, as long as needed to fit your puppy’s ears. Place one strip in the interior of each ear without covering the ear channel. Cut two longer strips of tape. Wrap a strip around the base of each ear, making sure not to wrap too tightly. By the end of the process, your Crested should like it has two little horns sticking out of its head. Leave the strips on for no longer than 3 consecutive days and replace the tape when needed. Let your pup’s ears breathe for a few days between taping sessions until the ears stand up on their own. Whether hairless or Powderpuff, Cresteds shed little to no hair, so they won’t trigger allergies as badly as other breeds. They’re the perfect dogs for you if you’re sensitive to dander. You can make your pet even more allergy-friendly through frequent baths and brushing sessions. Keeping the coat clean and brushing it often reduces loose hair and prevents the aggravation of proteins in dander. Between baths, wipe down your dog’s skin and hair with a damp cloth, especially if your Crested’s been playing outside. 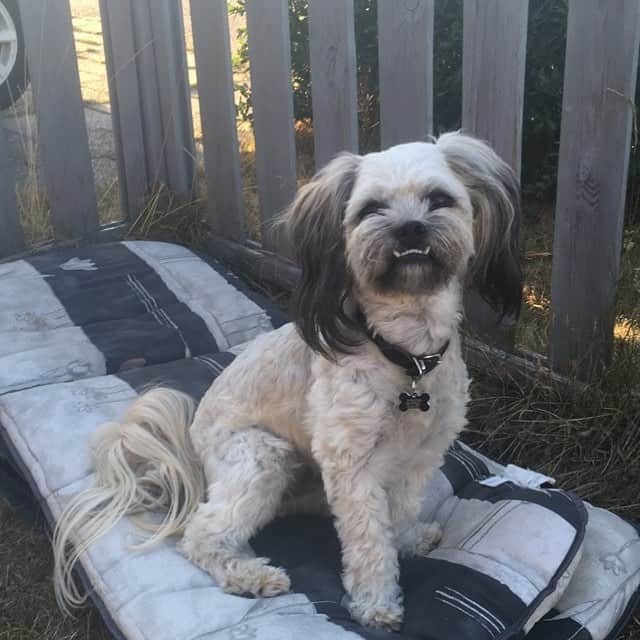 All Cresteds have a primitive mouth – meaning most of their teeth have pointed ends – but Hairless Chinese Crested dogs have drawn the short straw when it comes to teeth. Brush your Crested’s teeth and gums 2 to 3 times a week to remove food debris and prevent the buildup of plaque. Make sure to use dog-safe toothpaste from the vet or the pet supply store. If your dog doesn’t like having its teeth brushed, you can give it dental treats instead. Dental treats like rawhide chews work great at removing tartar from the surface of the teeth and help keep the breath fresh. You can also protect your Crested’s teeth by giving it a softer, flakier variety of dog food. Hard kibble may end up breaking your dog’s sensitive teeth. Aside from poor dentition, these dogs are also predisposed to a few genetic conditions. Eye problems, including progressive retinal atrophy, primary lens luxation, and glaucoma, commonly occur in this breed. These eye conditions can be serious enough to cause blindness. Allergies and other skin diseases also affect most Chinese Cresteds. Due to the sensitive nature of the Crested’s skin, sunscreen is a necessity when spending time outdoors. This dog is highly intolerant of cold weather, so make sure to bundle up your Crested in a sweater or jacket in the winter. Keep them away from wool, though, as many of these dogs are allergic to the material. Many Powderpuff Chinese Cresteds are afflicted with epilepsy. The seizures have a variety of causes, but the problem is often inherited. Your vet will usually prescribe medication to keep the seizures under control. Barring genetic diseases, Chinese Cresteds have a life expectancy of 13 to 15 years. Considered an ancient breed, the Chinese Crested may trace its origins from African hairless dogs that were brought to China by sailors. Cresteds enjoyed immense popularity in China not only as rat catchers on trading vessels but also as companion dogs, thanks to the breed’s loving temperament. They worked as guardians of temples and in kitchens at the palace, particularly during the Han dynasty. As mainstays on Chinese ships, the breed traveled all around the world, reaching shores as far as South Africa, Turkey, and Egypt. With the Cresteds being traded by sailors in various port cities, local versions of these dogs appeared wherever they visited. European explorers even recorded sightings of Crested-type dogs in Central and South America. By the mid-19th century, the Chinese Crested had reached Europe, appearing in paintings and exhibitions. Cresteds made their US debut in the 1880s and entered the AKC Stud Book only in 1991. Chinese Cresteds may have been therapy dogs in ancient China. Like their African ancestors, hairless Cresteds are known for their ability to emit heat. The Chinese used these dogs as living heating pads and bed-warmers that provided relief and comfort from chronic pain. The best way to make sure you get a healthy hairless or Powderpuff Crested puppy is through a reputable breeder. Good breeders of Chinese Cresteds do the necessary screenings to rule out potential health problems and will be able to present health certifications. Breeders may charge anywhere from $1000 to $4000 for each Chinese Crested puppy, depending on the pup’s pedigree. In comparison, adopting a Crested may cost you around $300, which covers the expenses of care before adoption. The Crested passes down its sweet, playful nature to many Chinese Crested cross breeds today. Called the Crested Beagle, this small hybrid often has the color pattern and round eyes of the Beagle and the laid-back temperament of the Chinese Crested. 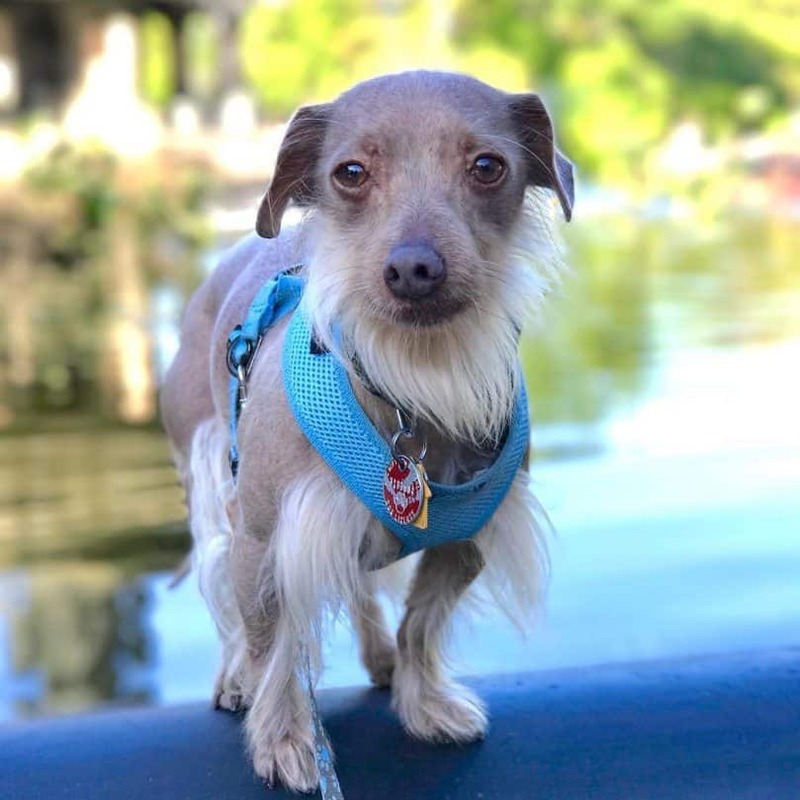 Crested-Dachshund mixes, named Crestoxies, are brave little dogs that display the willfulness of their Dachshund parents. As the hybrid of playful breeds, the China Jack needs at least 45 minutes of exercise daily and will have a high prey drive. The Crested Peke is extremely affectionate and will love to stay by your side all day, as both its parent breeds are known for their clingy nature. There’s plenty to love about this small, subdued breed. Cresteds are loyal companion dogs who are always up for a cuddle. They’re always looking for ways to please and entertain their owners. Plus, their low-shedding coat makes them ideal for people who suffer from allergies. However, the Crested can suffer from separation anxiety. Keeping this breed in good health also requires some effort. Hairless varieties need plenty of skin care, while Puffs have coats that need daily brushing. Have a Chinese Crested of your own? Tell us about it in the comments!